Yesterday during lunch, I posed a question on Instagram, asking y'all what you'd like to see me create. 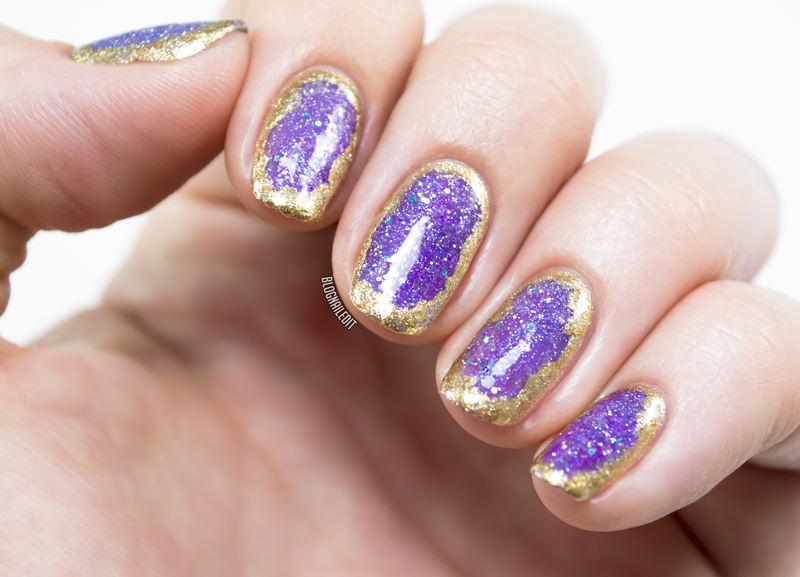 Several of you asked for geode nail art. There are a lot of interpretations for "geode", but the first thing that came to my mind was amethyst...that good ole reliable rock with the purple in the middle. It looks a little something like this. Surprisingly, this isn't hard to create at all! First, I used Glitter Off (the OPI peel-off base coat) because I knew I'd have way too much glitter on my nails to take off without a peeling base coat. 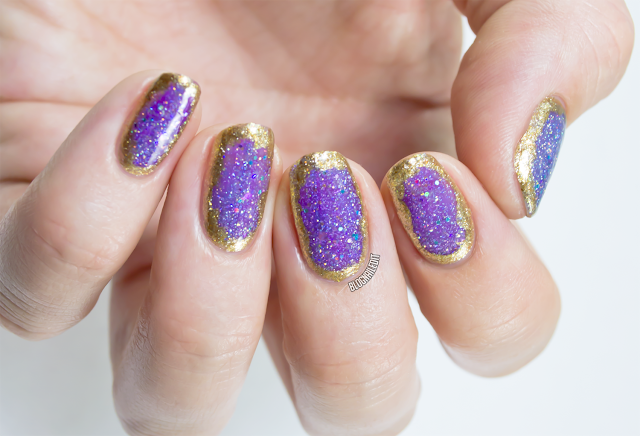 Then, I painted the center part of my nails with Holo Chrome. It was perfect because it was slightly sheer. Then I used Are You Jelly? 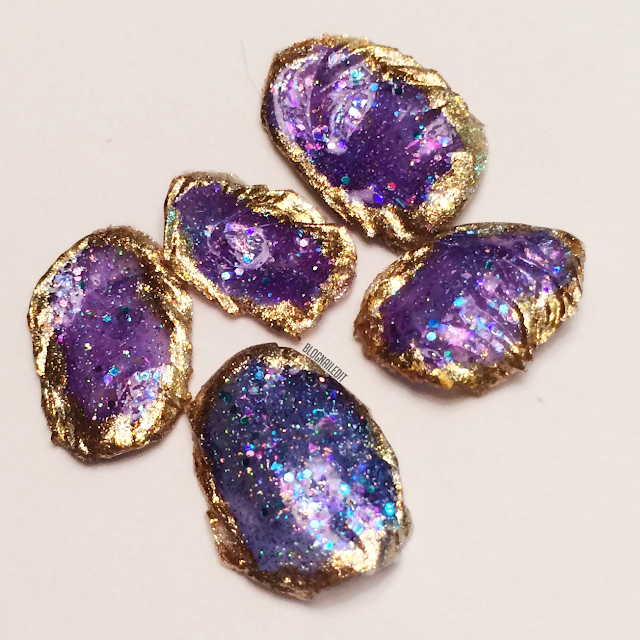 to get the right color of the amethyst, then layered a little The Worst Possible Thing over the top, giving it a real gem look. Finally, I outlined each nail with Peterhof Palace, being slightly sloppy to keep it "organic". Thanks for the suggestion girls, it turned out fabulous! One of my favorite parts of this was the removal. Remember how I used that Glitter Off base coat? Well when I peeled off the layers, I had little leftover amethyst stones! I liked them so much I framed them. Is this something y'all would like to see as a tutorial? Let me know in the comments! Pleeeeezzzzzz give a tutorial of this look. Purple is my favorite color and purple and gold I can never get tired of. Pleeeeezzzz do a tutorial of this look. Purple is my ultimate favorite color and purple and gold is something that I could never tire of. 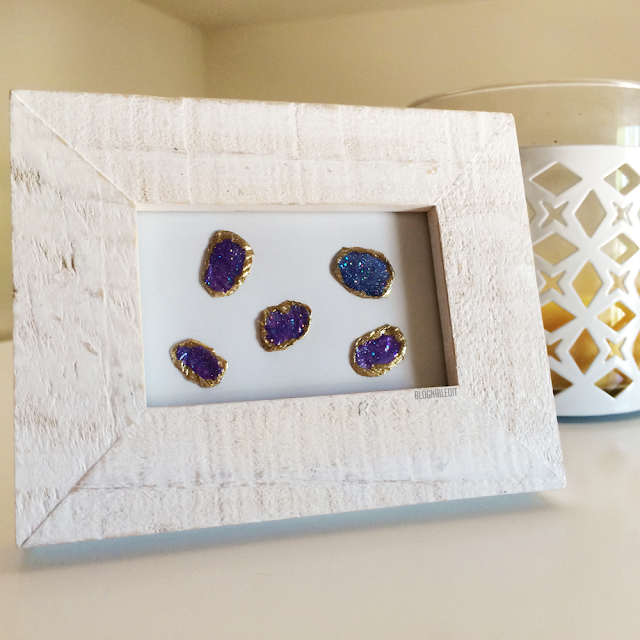 They really do look like cute little amethysts in that frame, how pretty! :) Love this manicure. I love this! They look so great in that frame! I'm basically dying over the frame. That's awesome and I have totally framed a nail wheel I was particularly proud of . . . only I get raised eyebrows from everyone who sees it! It's nice to know I'm not alone in thinking considering nail art worthy of framing.